Family and friends of Keith Childress Jr. (pictured) want answers after the 23-year-old was shot and killed by Las Vegas police who mistook his cellphone for a gun. Las Vegas police have released body-cam footage of the fatal shooting of a 23-year-old unarmed man. According to KSN, Keith Childress Jr. was wanted after failing to appear for sentencing in a 2013 Arizona home invasion during which Childress and other suspects stole computers and electronic equipment at gunpoint. Childress failed to appear at his scheduled sentencing in mid-December following his conviction on several charges, including "aggravated assault, armed robbery, kidnapping, burglary and theft," KSN reports. U.S. marshals learned that Childress was in Las Vegas and began following him the morning of New Year's Eve. As the marshals closed in, authorities say, Childress began running to evade capture. Marshals then enlisted the help of Las Vegas Metro Police, except, according to police officials, the marshals indicated that Childress was wanted for attempted murder, a charge he was never accused of. "We were told over the air that he was an attempted-murder suspect and there was a gun located in the vehicle he just fled from," Police Undersheriff Kevin McMahill said during a news conference. "Other than that, the information provided to us was limited." Police officers found Childress and told him to drop the gun. According to police, Childress continued walking toward them, and two officers opened fire. Childress was pronounced dead at the scene, and police later acknowledged that Childress didn't have a gun and had been holding a cellphone. 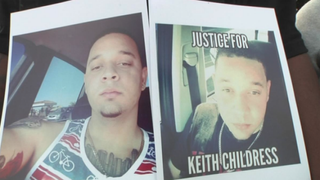 "They took somebody's son," Gabriela Larios, a friend of the 23-year-old Childress, told NBC San Diego. "They took our friend. We just want to know what happened and we just want to know why!" The two officers involved in the shooting, Sgt. Robert Bohanon, 37, and Officer Blake Walford, 27, have been placed on routine administrative leave. Read more at KSN and NBC San Diego.